Do you have certain things that you love during the holidays? Throughout the holiday season, I am a complete pumpkin fanatic. There is nothing I want more than a nice, yummy pumpkin muffin or a piece of my mother’s pumpkin pie. While I love all of these desserts, they can be very time consuming to make, especially during those times where blogging, holiday parties, and preparing for holidays eats all of my time. For these times, I fall back on no-bake recipes. Before you get on me, let me be clear. I am not one of those people who turn to store-bought box mixes and call it a day. Yes, box mixes are a part of some of my recipes but I always jazz them up or make them something more. In all honesty, the only reason I still use those mixes occasionally is because I haven’t found an easy, natural alternative just yet. My no-bake cookies, however, are completely from scratch – one way that I can guarantee I have total control over the ingredients. Knowing that many of you love pumpkin just as much as me, I couldn’t wait to share with you my No Bake Pumpkin Spiced Oatmeal Cookies Recipe. Once you have tried this recipe, you will never buy store bought no-bake cookie mixes again! Looking for delicious, easy to make no bake oatmeal cookies? 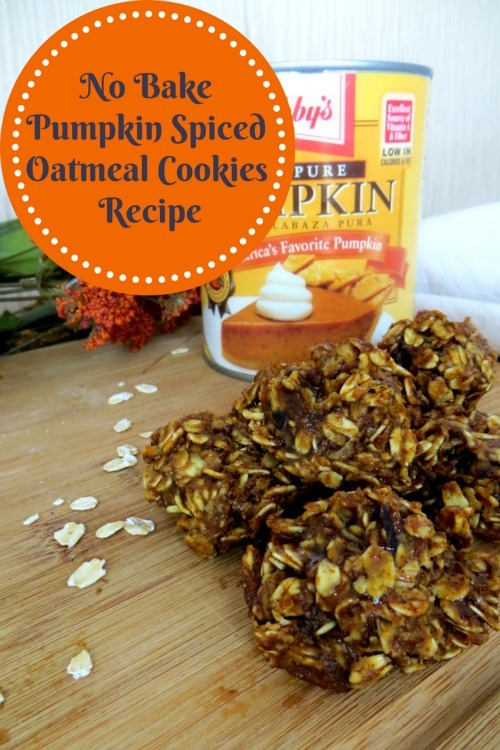 Check out our No Bake Pumpkin Spiced Oatmeal Cookies Recipe here! In a sauce pan, combine the pumpkin, cinnamon, nutmeg, and clove. Stir constantly on medium heat until it starts to boil. Reduce to low heat as soon as it starts to boil. In the same saucepan, add the granulated sugar, brown sugar, liquid caramel, butter, and milk. Stir the mixture on low heat until it is once again at a boil. and cook until mixture comes to a boil, bring to low heat. Mixture is ready for the next step once it is smooth and the sugar is completely dissolved. Once you have a smooth mixture, add the vanilla extract and salt. Mix thoroughly. Take the pan off the heat and start mixing in the oats, about a ½ cup at a time, until it is completely coated in the pumpkin mixture. Place parchment paper on a pan or counter where the cookies will not be disturbed by kids, animals, or husbands. Using a tablespoon, drop small pumpkin balls onto the parchment paper. When finished, sprinkle with sea salt. Let cookies stand, untouched, at room temperature for one hour. Serve at room temperature after the hour or place in a refrigerator until cool. Those sound good. I am one of those people that will use a mix. At least that way I know the cookies will turn out well. This looks so good. I love pumpkin recipes this time of year. Going to try this, the kids really like pumpkin, so I try to find new recipes to fix. Yum, these look delicious. Thanks for sharing. I love pumpkin and pumpkin pie spices. These are delicious. They are super simple to put together too. wow this isn’t your typical no bake recipe for cookies – I love it and want to try it. Caramel, cinnamon, pumpkin yum! Looks so yummy to eat and easy to make. I’m so saving it on my Pinterest.